The AARP DataExplorer site also features “storybooks”. Storybooks provide context for some of the data and help users understand the story behind the data. 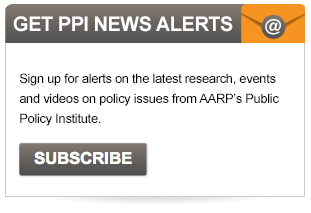 AARP's Public Policy Institute is the focal point of public policy research, analysis and development at AARP. Founded in 1985, PPI publishes policy analysis on a range of topics throughout the year. PPI also informs and stimulates public debate on the issues we face as we age, frequently convening leading policy experts for discussion of key national and state policy issues. PPI experts cover a wide range of issues from Social Security and Medicare to health reform, livable communities, consumer protection, long-term care, care-giving, financial security and more.